Jenny Mollison, from the Scottish Allotments and Gardens Society, gave us a handful of carlin peas earlier in the year. 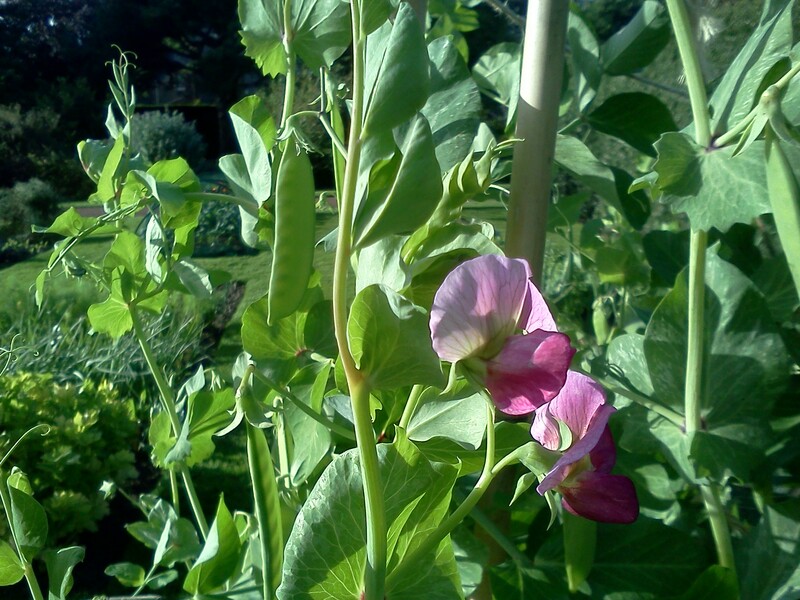 We dutifully planted them and I’m pleased to say they have done well and the peas are ready to harvest. Carlin peas can be eaten fresh or left on the plant in order that they dry for storage. They can be used at a later date for soups and stews and are reputed to be the original ‘mushy pea’. Carlin peas have an interesting story attached to them. Jenny wrote an article about them in the Scotsman back in March. Click the link to find out more. In areas around Newcastle the peas have their own day, Carlin Sunday (the week before Palm Sunday). The story goes that the people of Newcastle were under siege and starving during the 1644 civil war. A French ship was wrecked just off the coast and shed its load of carlin peas. The peas washed ashore and saved the population from starvation. The garden is looking good after a few days of sunshine and warmth, in addition to harvesting peas we have courgettes, celery, beetroot, potatoes, chard, spring onion, radish and even a handful of tomatoes. The sweetcorn is fattening nicely and will hopefully be ready for our Harvest Festival . We are holding our annual celebration on Sunday the 23rd September from 11am – 5pm this year. Come along and see the gardens and produce. With live music from the Barrow Band and kid’s activities we will be in for a fun packed day. Find out more here.